Standing in front of the University of Texas tower, look back over your shoulder and this is the view you see. 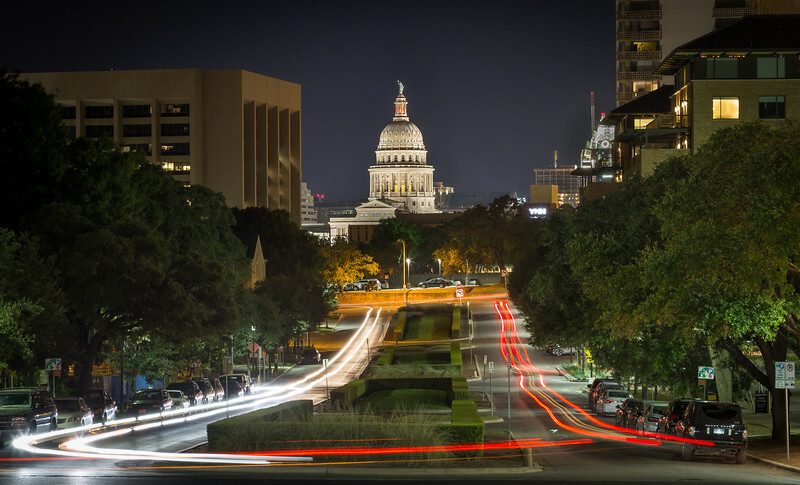 Looking down University Avenue, the Texas State Capitol also towers over Austin. Beside standing out for its architectural uniqueness, the white dome lights the skyline and is hard to miss. On a recent trip in Austin, my friends and I had been by the tower a while. Jeremy Mancuso and David Morefield were still shooting the tower, but Andy Crawford and I were looking for something else to entertain us. While having nothing against the UT Tower, we were looking for something else to shoot also and thought the light trails from the cars made for a fun diversion.